Today’s blogger is Dr. Leisa Martin, Assistant Professor of Social Studies Education at The University of Texas at Arlington. She writes here about research recently published in an article (co-authored with Dr. Glenn Lauzon, Dr. Matthew Benus, and Mr. Pete Livas Jr.) in The Educational Forum. The main purpose of schools is to prepare youth for citizenship in our democratic society, and schools offer an opportunity to reach youth across the nation over an extended period of time. To promote loyalty and love for the United States, Francis Bellamy, the author of the U.S. Pledge of Allegiance, and James Upham, the creator of the Pledge salute, partnered with the U.S. government and school superintendents across the country to host the first nationwide Pledge of Allegiance recitation in October 1892. Over the years, the Pledge has become a school tradition. But are today’s diverse youth still choosing to embrace this time-honored practice? Our study took place in the northeastern United States with 191 high school students, of whom 88 were Akwesasne Mohawks, 80 were European Americans, and 23 who classified themselves as Other. Via two open-ended survey questions, we asked the following: 1) While the U.S. Pledge of Allegiance is being recited, do you say it? Why or why not? 2) What do you think about while the U.S. Pledge of Allegiance is being recited? Following the surveys, to obtain clarification, we led 25 follow-up interviews. We analyzed the data using the constant comparative method to obtain response categories, and then, we used chi-square tests to learn if statistically significant differences existed between the ethnic groups. With respect to their thoughts during the Pledge, the chi-square revealed that the Mohawk students were more apt to have thoughts of dislike about the Pledge compared to their European American peers and their peers who classified themselves as Other. For example, a Mohawk student commented, “I don’t really care for it. I don’t listen to it. I ignore it.” In addition, the chi-square tests indicated the Mohawk students were less disposed to have patriotic thoughts during the Pledge of Allegiance compared to classmates who were European Americans or who classified themselves as Other. U.S. schools were developed to socialize students. In my previous research with primarily European American and African American high school students (Martin, 2012), the students generally expressed positive views about the Pledge. Similarly, in a study with students of unspecified race/ethnicity (Parker, 2007), students accepted the Pledge and saw it as a normal part of life with very little need for critical reflection. However, socialization via the schools is not an automatic process; traditions from the past may change in the present. For example, in our study, 68.6% of our participants chose to reject the Pledge and its underlying call for e pluribus unum. Because U.S. society is becoming increasingly diverse, future research offers an opportunity to examine attitudes about the Pledge on a national level. KDP is proud to partner with Routledge to share Dr. Martin’s article free with the education community through July 31, 2017. Read the full article here. Today’s blogger is Dr. Alan Amtzis, academic editor of The Educational Forum. He is Director of the Master of Education in Instruction Program at The College of New Jersey. This year marks the 80th anniversary of The Educational Forum. Out of curiosity, I returned to the first issue of The Educational Forum to see how we began and what educational research looked like in November 1936 as the planet perched on the brink of encroaching war, struggling against both worldwide depression and growing fascist threat. Our first issue contained 10 articles, and not one author’s name was familiar to me now in 2016. That issue also included an editorial, a poem, and 20 pages of book reviews. The only reviewed book I’d ever heard of was Gone With the Wind—a book whose popularity is legendary, but whose contribution to educational research and practice rather eludes me. As one of the academic editors of The Educational Forum, I admit to some pride about the direction that KDP and my coeditors (Tabitha Dell’Angelo and Ryan Flessner) have given to the journal. In addition to theme issues on aesthetic education, sexuality and gender identity, and global citizenship, we have also offered guest-edited issues by such senior scholars as Michael Apple (“The Politics of Educational Reforms,” 2016), Pedro Noguera (“Racial Inequality and Education,” forthcoming in 2017), and Ana María Villegas (“Linguistically Diverse Classrooms,” forthcoming in 2018). In addition, we’ve published a wide array of research developed by emerging scholars, many of whom are still in their pre-tenure phase. This combined range of experience and perspective offers our readers a substantial complement of the ideas that are important to users of educational research, as evidenced by the fact that many of our most cited articles have been published within the past 6 years. Still, I can’t help wondering if these issues and names will be known to readers 80 years from now. It’s an interesting and even challenging time right now to be the editor of an educational journal. In fact, it’s an interesting and challenging time to be an educator. Here at the close of 2016, we face what many feel is a pivotal moment in U.S. and world history, with challenges ahead we can only guess at. For me, this moment raises questions about the ability of educational research to not only reflect the interests of our readers, but also to influence and contribute to the world of education…and the world beyond the classroom. Are there opportunities for our work at The Educational Forum to inform and even influence policy? Can we withstand the current storm to publish work that will be of interest to a new generation of educators? Of course, these questions are difficult, at best, to answer and the outcomes may be impossible to predict, but the changes around us may prompt us to envision a kind of educational activism as part of our mission—one that might help the journal endure another 80 years. A teacher, a Falcon, and a Kadelpian for life. A few weeks ago, the Dean of the College of Education and Human Development, Dr. Dawn Shinew, contacted me and asked if Kappa Delta Pi members would be interested in meeting Muriel Hutchinson Strebe and honoring her at a Classroom Dedication ceremony. After some inquiring, I learned that Mrs. Strebe was a successful elementary school teacher and had made Bowling Green State University the beneficiary in her estate plan as well as established the Muriel Hutchinson Strebe Scholarship for students entering the College of Education. So, naturally, I agreed, looking for any opportunity to demonstrate Kappa Delta Pi’s support of fellow educators. After rallying the KDP members that were available during the day on a Friday, we made our way to a personal meet and greet with Mrs. Strebe, taking our seats at a round conference table on the fourth floor of the Education Building, waiting for this generous woman who was being honored throughout the College of Education. Dressed in orange with a large golden medal hanging around her neck. Helping her in is Dean Shinew, along with the college assistants who have been with her the whole day. She smiles at us and laughs, explaining that golden medal meant that she was a “Golden Falcon,” an award she won for being an involved alumnus. She is remarkable, so excited to talk to fellow education students—students to whom she has given so much. After she sits down, I introduce myself and tell her that I am President of our campus chapter of Kappa Delta Pi. She said, “Yes, I was a part of this chapter when I went to school here.” I look at her, astonished, and then I look at the dean. I couldn’t believe it. This incredibly gracious woman was a part of OUR chapter. The Delta Phi Chapter! I was so excited. 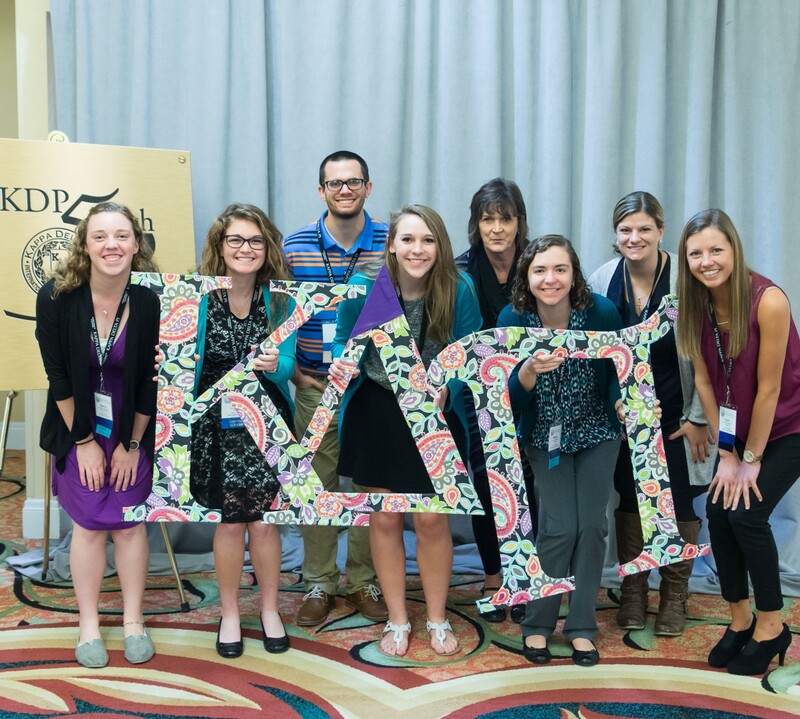 No one in this room knew that she was a member of Kappa Delta Pi before that moment. I motioned for the next KDP members to introduce themselves, while I scanned my mind for ways to recognize this woman as a KDP member. The Chapter binder that every KDP initiate has signed for decades. Her name was probably in it! What better way to welcome her home than by showing her the binder she signed more than 65 years ago. I excused myself from the conference room and ran across campus to get it. It was in our KDP office, only 5 minutes away. I unlocked the cabinet and went to the very back of the binder. Loose-leaf papers were ripped and aged, with some barely hanging on in the binder. I saw that the pages went back only to 1958, and so the years 1958 down to 1947 were either never documented or were missing. I knew our chapter was more than 75 years old, so Muriel Hutchinson Strebe would more than likely have been initiated her freshman year. It saddened me that I couldn’t present to her the initiation page she signed so long ago. It was time to be creative and find a way to honor this remarkable woman through Kappa Delta Pi. Then I see them, the blank certificates in the cabinet. Maybe I could re-initiate Mrs. Strebe and honor her a second time. I knew she was worthy of it, for who better exemplified the words of the Kappa Delta Pi creed? Mrs. Strebe has lived the ideals of Fidelity to Humanity, Science, Service, and Toil. She has inspired and strengthened others and is the essence of Knowledge, Duty, and Power. I grabbed the binder, a blank certificate, and a creed. I quickly walked back to the conference room, knowing exactly what I was going to do. I entered the room while the members were wrapping up their introductions. I looked at Mrs. Strebe and told her that our records had been misplaced, and I couldn’t find her signature—but, if she would be okay with it, I would like to re-initiate her so she can be added to our binder. She laughed and said that she would be honored! I placed the binder on the table and read a small portion of our ceremony ritual. I then handed her a pen, and she signed our Society Charter for a second time. We all clapped after she signed, and I held her hand, thanking her for agreeing to sign our book and be a part of the Kappa Delta Pi Class of 2016. While she was in another meeting, I went to our Technology Resource Center and printed a fresh Kappa Delta Pi certificate with her name and the date on it. When I saw her after the classroom dedication, I gave her the folder with the certificate and the creed. I thanked her for everything she has done for education students and asked if we could take a picture with her. This picture includes Kappa Delta Pi members old and new, as well as Freddie and Frieda Falcon, with Muriel Hutchinson Strebe in the center. Kristen Tabesh is a 4th year student at Bowling Green State University and the President of the Delta Phi Chapter of KDP. She is a Middle Childhood Education major with concentrations in Language Arts/Reading and Social Studies. Kristen has wanted to be a teacher for as long as she can remember, and she absolutely cannot wait to have a classroom of her own. Read more of this story on the Bowling Green State University page.